I first applied for a passport when I was finishing college. When it arrived in the mail, I remember feeling a huge sense of freedom. Now I could travel to all the amazing places I wanted to go! I still get that thrill whenever I use my passport. I like to know that I could just hop on a plane and travel to exotic destinations. Since our youngest will need his passport soon, I’ve been reminiscing on all the passport application experiences we’ve had. Between applying for our passports, our children’s passports, and replacing our passports when a well-meaning wife did laundry not knowing our passports were still in her husband’s pants pocket, we’ve gone through the process several times in several areas of the country. Here are some tips that we’ve learned along the way. FYI, when applying for a passport for a child, both parents need to be present, or you must provide notarized documentation from the second parent giving their permission for their child to apply for a passport. All the necessary details can be found on the website linked above. There are two kinds of places where you can apply for a passport, a Passport Agency or a Passport Acceptance Facility. A Passport Agency is a government agency solely for the purpose of processing passport applications. 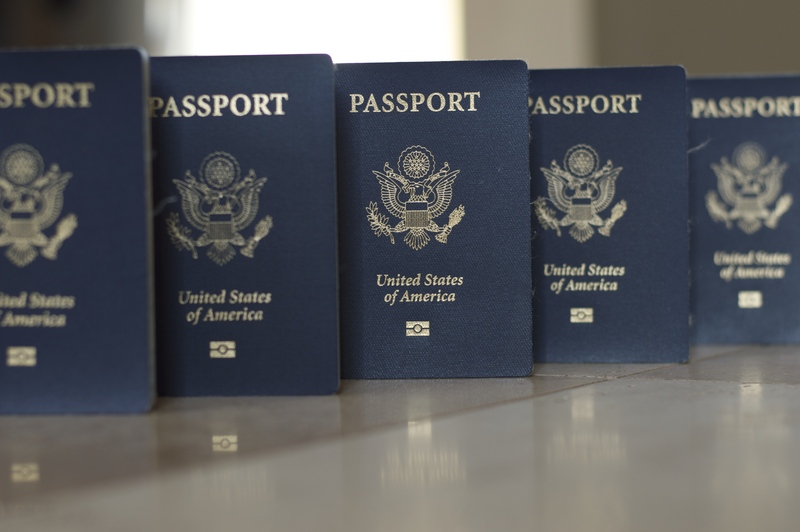 Some Passport Agencies require proof of international travel within a short time period and require an appointment. They are the best option if you need expedited service. Expediting a passport application is a more expensive option. A Passport Acceptance Facility could be a post office, library, or a municipal office of some kind. There are many more Passport Acceptance Facilities than Passport Agencies, so it might be more accessible option. Some require appointments. Some can take pictures for your passport application. To use a Passport Acceptance Facility, I recommend applying for your passport at least four months before a planned trip. Why, you may ask? Just in case something goes wrong. When applying for our third daughter’s passport, the agent at the Passport Acceptance Facility made a mistake on her part of the paperwork. Six weeks after we applied for her passport, we received a letter telling us there was a problem with the application. We were leaving for Italy within two weeks from receiving this letter, and the only way to get her a passport in time was to drive two hours to the nearest Passport Agency. They were able to get us her passport same day, but we had to pay expedited fees on top of the original application fees. Four months gives you plenty of time to address any issues with the original Passport Acceptance Facility should there be a problem. Some locations will take pictures for you, but it’s better to have them taken before you apply for your passport. We didn’t know this when we applied for our first daughter’s passport. The website said they could take pictures on site. And they could, but she was so little that I had to kneel down and prop her up trying not to let my hands show in the picture. If she hadn’t been coordinated and strong for her age, we would have had to go somewhere else to have pictures taken and make a new appointment. A photography studio or even the local Walgreens are much more prepared for taking passport pictures of young children. They are both less expensive and more accommodating. You can preview the picture before they print it, and they’ll retake it if you don’t like it. The entire process takes maybe 15 minutes. I recommend getting extras. You never know when they’ll come in handy. Part of being prepared for any contingency is to have extras, extra pictures and extra birth certificates. Had we not had an additional copy of our daughter’s birth certificate, we would not have been able to go the Passport Agency to clear up the problem with her application because they did not return the copy we sent in with the application until after we returned from our international trip. I always get three copies of our children’s birth certificates so we have extras exactly for these bizarre situations where they suddenly become necessary. It’s the same reason I always get two sets of passport photos. In this case, redundancy is helpful. It is very easy to print out the necessary paperwork and have it all filled out before you go to your appointment. This is helpful for two reasons. One, it forces you to gather all the necessary information. You won’t be missing any. Two, anyone who has spent time at a government agency (think DMV), especially with young children, knows that you want to spend as little time there as possible. The more prepared you are, the less time spent sitting on a hard plastic chair trying to keep your children entertained. If all goes well, there won’t be any mistakes on the application you’ve filled out, and you’ll be out of there fairly quickly. If there is a mistake, it won’t take long to copy down the information and fix the mistake. You’ll still be out of there fairly quickly. Bringing your own previously taken pictures will also help you get out of there more quickly. This will make you and your children happy. All the passport agencies we’ve been to have been staffed by friendly, helpful people. Even those times when there has been a snag in the process, the workers have been very kind. I hope this information is helpful, and that you have a good experience while applying for your passport. If you have any additional tips, please share them in the comments. Happy traveling!